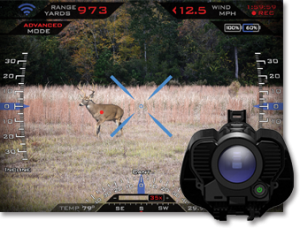 The XactSystem’s tracking scope takes the ballistic guesswork out of long range shots by doing all of the math for you. The shooter designates the target by pressing a button with the crosshairs aligned over it. The scope determines and accounts for range, bullet drop, Magnus effect, barometric pressure, temperature, relative humidity, muzzle velocity, lock time, ballistic and drag coefficients, spin drift, Coriolis effect, cant and inclination. The only external input required is the wind speed and direction, which must be called by the shooter (or spotter). 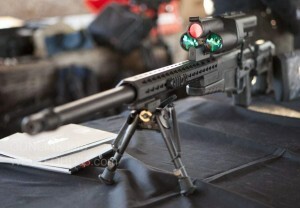 The shooter exerts pressure on the trigger and moves the crosshairs over the tracking dot, which follows the target. Once properly aligned, the rifle will fire and, if all goes well, the shot hits exactly where intended. Tracking Point claims that the XactSystem delivers five times the first-shot success rate of traditional systems at targets up to 1,200 yards. The system lived up to its “1000 Yards is Easy” slogan when our photographer, Westford86, nailed the 1000 yard target with his first shot at the SHOT Show Media Day at the Range. In addition to simplifying long range shots, the networked tracking scope offers a number of other nice features, including a built in wi-fi server that allows the shot data and scope view to be recorded or streamed to wireless devices like tablets or smartphones. This makes it easy for hunters and outfitters or shooters and spotters to collaborate. Perhaps more importantly, it makes it easy to prove to the guys back home that you really did take down that elk at 1,200 yards with one shot on your big hunting trip out. There is no doubt that this is an amazing system with a tremendous amount of R&D behind it. It is a great system that can be mastered almost instantly and allows almost anyone to make long range shots that they wouldn’t otherwise make. 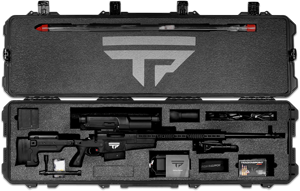 The closed-loop PGF system comes with the firearm, smart scope, iPad Mini loaded with TrackingPoint and ShotView apps, 200 rounds of XactShot ammo loaded to +/- 10 FPS by Barnes, Harris bipod with LaRue QD mount, custom Pelican case, batteries and chargers, scope cover and cleaning kit. All of this tech comes with a hefty price tag, however. The XactSystem is currently offered in three versions: two flavors of .300 Win Mag and a .338 Lapua version. Depending on options, the .300 Win Mag systems cost ranges from $17,500 to $20,000 while the .338 system weighs in at $22,500. With prices in that range, we’re not sure who the target audience is. Clearly, however, there is a market for the systems; company staff in the Tracking Point SHOT Show booth confirm that they have already received orders for around 100 units. Given what all you get with the system and the work that went into it, the price range might not seem all that high for the very enthusiastic long-range enthusiast or as a rifle for outfitter’s to provide to hunting clients. To learn more about the Tracking Point Xact System, visit their website or the SHOT Show Optics thread on the GunLink Forums. are any of these rifles available in a left hand action?